Employers should engage their Relocation Management Company (RMC) early in the relocation process. Employers often go to great lengths to define the questions they ask RMCs in their Request for Proposal. Several employees from departments including Human Resources, Accounting, Legal, and Procurement may spend a significant amount of time finding and selecting an RMC with the knowledge and experience that will completely serve the needs of the company, transferees, and new hires. With all of the effort to find an RMC that best matches all of their requirements, wouldn’t you think that employers would actively engage the RMC in their relocation process? Most companies do a good job communicating to their hiring managers and others throughout the organization how to utilize all of the resources their RMC provides. However, even with this communication, sometimes the hiring manager or others do not engage the RMC early in the process. This may lead to several consequences for transferees and new hires. What happens when employers do not engage their RMC early in the relocation process? Global Mobility Solutions’ Senior Vice President Business Development, Sam Hoey, met a transferee and heard a first-hand account of their experience. Their employer’s hiring manager did not initiate their relocation process in a timely manner, and they were left scrambling to find their own movers, real estate agents, mortgage provider, and temporary housing, all within just a few weeks before the new job start date. As a result, the transferee was stressed and unduly burdened by processes that the company’s RMC could have managed for them with greater ease. Let’s look at a few of these areas in detail to get a better understanding of what they entail. The busiest time of the year for relocations is during the summer months. Children are out of school, travel is relatively easy to arrange, and weather delays are minimal. As a result, van lines that move household goods are often extremely busy during this time. They may have bookings for moves going out four, five, or up to six weeks in advance. Employers looking to relocate an employee should understand the length of time their RMC needs in order to arrange booking a move of household goods at van lines, keeping in mind the preferred van lines may already have several weeks of booked moves already on their schedules. Without enough time, transferees may need to find their own household goods movers. If you have ever bought or sold a home, had to find an apartment, or sought a mortgage, think of those processes. How long did they take you to complete? These processes often require several steps including applications, reports, inspections, financial transactions, arranging the services of a notary public, and research to verify the new location meets the needs of everyone who is relocating, such as spouses, partners, children, and pets. Employers looking to relocate an employee should be aware of the processes their RMC needs to manage in order to help the employee find suitable housing arrangements. RMCs with experience in these processes are vital to ensuring the success of a relocation, as they help the transferee or new hire in many areas, and this in turn helps the employee feel happy and confident in their choice to relocate. Implement Pre-Decision Services so the employer, hiring manager, transferee, and/or new hire are actively engaged with the RMC early in the relocation process, and information can be shared that is helpful to the employee, the employer, and the RMC. Insert language into offer letters describing the RMC and the programs specific to the transferee or new hire. Integrate the RMC into Human Resource Information Systems and Talent Management Programs so hiring managers and program administrators always have ready access to information they can share with the transferee or new hire. 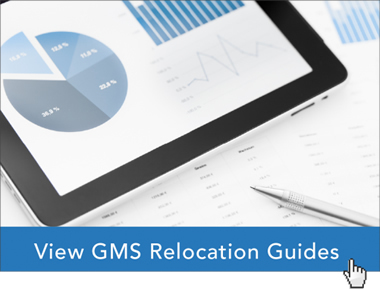 GMS’ team of corporate relocation experts has helped thousands of our clients develop relocation programs that attract and retain qualified employees. Our team can help your company by using industry best practices to design your relocation program so that you engage your RMC early in the relocation process.